GPOs can be configured Locally, at the Site level, the Domain level or at the Organizational Unit (OU) level. Group Policies are applied in a Specific Order, LSDOU. This order means that the local GPO is processed first, and GPOs that are linked to the Organizational Unit are processed last, so the OU level GPO overwrites settings in the earlier GPOs if there are conflicts. 3. 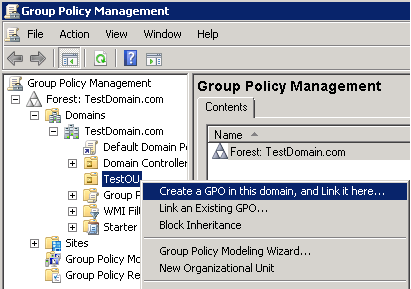 Type the new policy name and click OK and you can edit GPO settings by right-click on the newly created GPO and click Edit. 2. 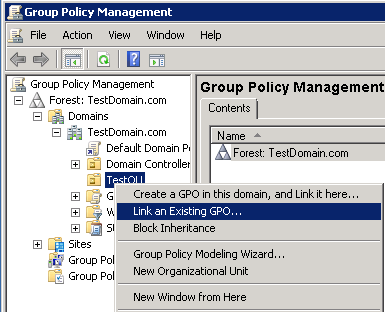 Expand the tree Forest >> Domains , right-click on the OU and click Link an existing GPO..., and select the Group Policy which you want to link, then click OK.